Ceramicist Tamsin Van Essen has designed a collection of vases inspired by the melancholy opulence of 17th century Dutch vanitas paintings. The collection explores the transience of beauty and the vulnerability of excess and aims to capture the fragile moment when abundance turns to decay. Rather than applying the decoration to the surface of the vases, Tamsin wanted the pattern and ornamentation to become inseparable from the form itself. 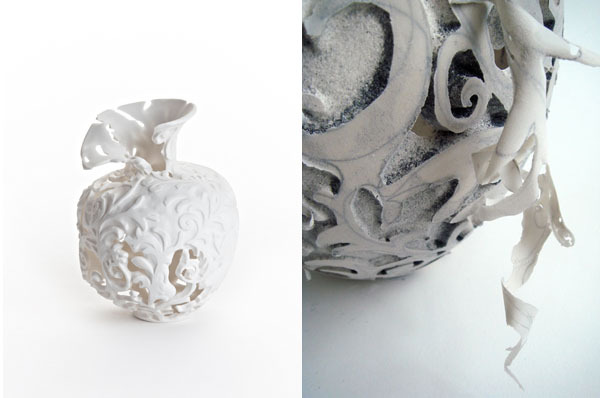 The vases were slipcast and then an industrial sandblaster was used as an etching tool to eat away at the porcelain. The decoration is integral to the body of the vase, rather than just being applied to the surface. 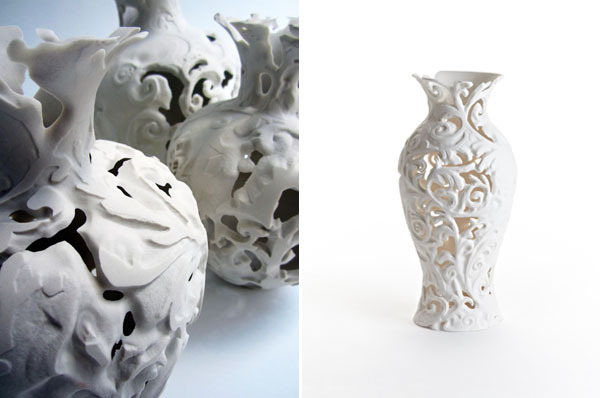 The pattern becomes the vase's structure, with the other areas appearing to be eroded away. Depending on the amount of deterioration, the vases may start to peel, distort and collapse during the final kiln firing, giving the delicate feeling of being 'on the turn': held just at the point of decay. Images 1,3 & 4 by Matthew Booth. Images 2 & 5 by Tamsin Van Essen.